Need a Dance Floor Experience in Boston, MA? Do you want to make your dance floor the place to be? Well, now you can with the amazing dance floor experience. This entertainment will not only have your guests excited and dancing. They will be taking pictures and interacting with the balloons and other guests. Transform your wedding disco or large event dance floor into the most sensational display of fun ever seen! What is the Dance Floor Experience? 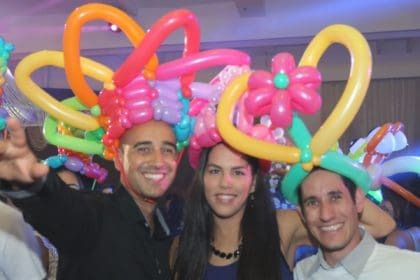 Entertainment with crazy, amazing balloons like no one has ever seen before–placed right onto the dance floor at your wedding reception or large event! These engineered experiences will truly create conversations for months! Don’t have a regular wedding disco – have the best in Massachusetts this year! It adds amazing color, a ‘wow effect’, a fun experience and an amazing atmosphere. These balloons are ART. They are special and guaranteed to please your guests. Imagine the compliments you will receive for organizing such a colorful, artistic and extraordinary event! It will truly be one of a kind and propel the party spirit into absolute, euphoric, overdrive! Your guests will now realize that your dance floor, and wedding, is AMAZING! In fact, it will be the best wedding disco in Massachusetts – ever! Our Balloon Artist Can Entertain Children and Adults Alike! 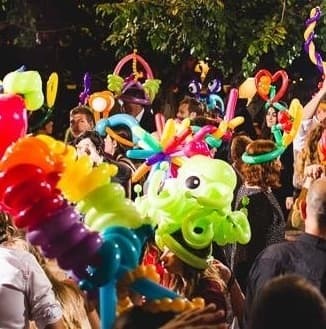 Balloon twisting isn’t just for kids; adults love it, too. Choose Jonah’s Twisters to create a fun dance floor experience for your next party. Call for more information or to book your date today!